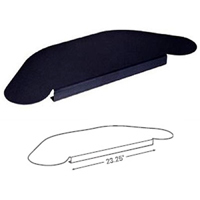 The Corner Conversion Kits from Fox Bay Industries are designed to convert a right angled or tightly curved inside corner into a usable work space. The steel plate creates a rigid bridge across the corner, converting an often cramped and awkward layout into an ergonomically suitable workstation. Users are now able to work turned to the corner with easy access to an expanded desk surface to both the right and left. These also provide a means of mounting an articulating keyboard arm into corners where they cannot otherwise be installed. Fox Bay Corner Conversion Kits are available in three sizes so users can select the size that best fits their workstation and meets their requirements. The 13.5" model works well on smaller workstations where there is limited space, such as tight cubicle applications. 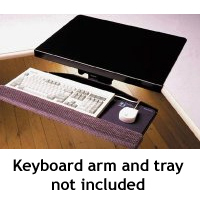 It provides just enough of a diagonal that most users would be able to work turned to the corner or also can serve to support a corner-mount articulating keyboard tray. The larger 21" and 26" models bridge a larger space for applications where there is sufficient room in the workspace to move the user further out from the corner. They can also support the installation of a keyboard arm if desired. The DE200 Series Corner Sleeve from Humanscale can be used to create a usable workspace out of a tightly curved or inside right angle corner. The steel plate creates a diagonal bridge (16.5" wide) between the supporting surfaces, enabling the user to fully utilize the entire workstation. The user is now given access to an expanded work area (right, left and corner), enhancing the ergonomics of the workspace. The curved shape of the DE200 Series Corner Sleeve makes it most suitable for installations where a keyboard arm and tray will be deployed. The underside of the unit is pre-drilled to accommodate most common keyboard arms with no additional modifications required. The Corner Sleeve DE200 can be adjusted to fit desks from 1" to 1.5" thick. The DE250 model (available by Special Order) can adjust to fit desks between 1.5" and 2.5" in thickness. Note: The curved shape and small dimensions of the DE200 Series Corner Sleeve are less than ideal for directly using a keyboard or mouse on it. There are several other larger products which are better suited to this purpose. The DE400 Series Corner Sleeves from Humanscale can be used to create a usable workspace out of a tightly curved or inside right angled corner. The steel plate creates a diagonal bridge (23.25" wide) between the supporting surfaces, enabling the user to fully utilize the entire workstation. The user is now given access to an expanded work area (right, left and corner), enhancing the ergonomics of the workspace. The large dimensions of the DE400 Series Corner Sleeve make it quite suitable for desk top keyboard and mouse positioning. The uniquely-shaped "wings" provide convenient mousing areas for both right and left-handed users. With a depth of 13.75" the DE400 Series Corner Sleeve will accept any common combination of keyboard and mousing device. It is also equally suited to keyboard arm and tray deployment as the underside of the unit is pre-drilled to accommodate most common keyboard arms with no additional modifications required. 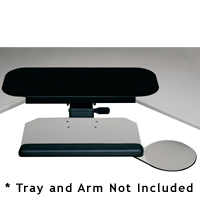 The DE400 Series Corner Sleeve is available in two models — the DE400 can be easily adjusted to fit desks from 1" to 1.5" thick while thicker desks (1.5" - 2.5" thick) can be accommodated by employing the DE450 which is available by Special Order. 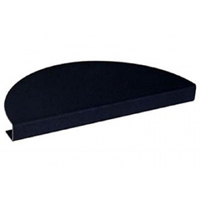 Note: While the DE400 Series Corner Sleeve provides a bridging width of 23.25" the overall width of 38.5" does require a fair amount of desk surface for installation. If there are space restrictions it may be necessary to consider a similar product with a smaller overall footprint.